Sources are reporting a stolen vehicle fled from officers in Rockford. It was occupied by 3 suspects. Several sources are reporting a large evacuation in Belvidere. Reports of a truck driver who hit a gas line near the shopping center on State st in Belvidere. Emergency personnel have evacuated the area. The shopping center near State and Fairgrounds. No reports of injuries that we have heard. Sources are reporting a rollover accident with injuries in Machesney Park. It happened around 6:30 am this morning in the Dunkin Doughnuts parking lot on N Second st in Machesney Park. A White vehicle hit a pole and rolled over into the parking lot. Extrication was originally dispatched, but was not needed. Injuries were reported. Unknown on the severity of the injuries. Sources are reporting a large fire in Roscoe. Reports of a large field on fire. It is not yet known if this is a controlled burn or possible fire department training. UPDATE: Winnebago County Coroner said 27 year old Xzavier Parker has passed away from smoke inhalation. It happened around 1:20 am this morning in the 1000 block of N Court st.
Reports of a house on fire near this location. Reports of at least one victim injured and trapped inside. Possibly a child. Unknown on the severity of the injuries at this time. UPDATE: RFD was able to rescue one victim from the fire and transport them to a local ER. Victim is in critical condition. Unknown if it is an adult or a child. This is still developing, check back later for updates. Sources are reporting a head on collision in Boone County. It happened around 3:30 pm today in front of the Boone County Fairgrounds. Three vehicles are involved in the accident. It is reported to be a head on collision. Injuries were being reported. We been told there are multiple injuries. The severity of the injuries we were told are believed to possibly be life threatening for one of the victims involved, but not yet confirmed. Note: Sounds like an emergency helicopter has been dispatched to the scene. Several sources are saying this is a very bad accident scene. Please avoid this area. Several sources are reporting 2 military Chinook helicopters were flying in the area this morning. There were 2 military Chinook helicopters that were flying in the area. At least one of them landed at the National Guard Armory in Machesney Park. It is unknown why they were in the area. 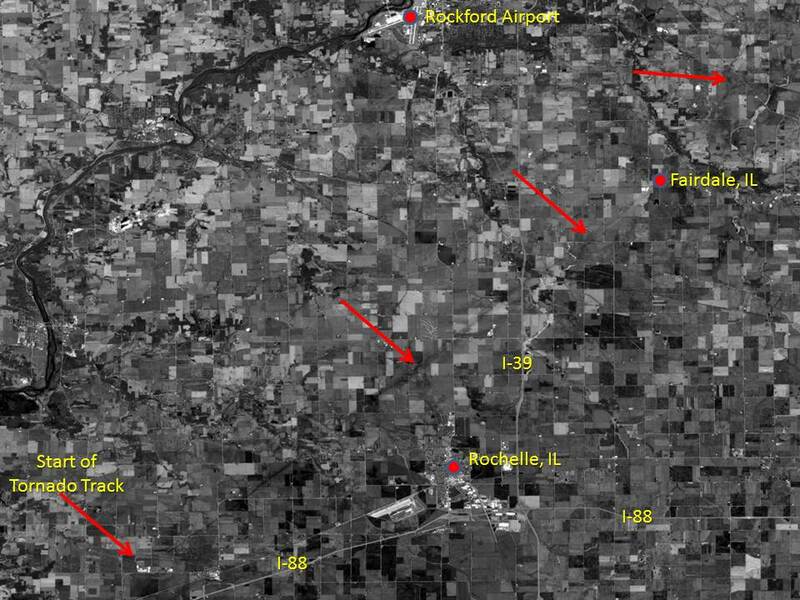 The 2015 Rochelle–Fairdale, Illinois tornado was an extremely violent and long-lived tornado that tore through the communities near Rochelle and in Fairdale, Illinois throughout the evening hours of April 9, 2015. 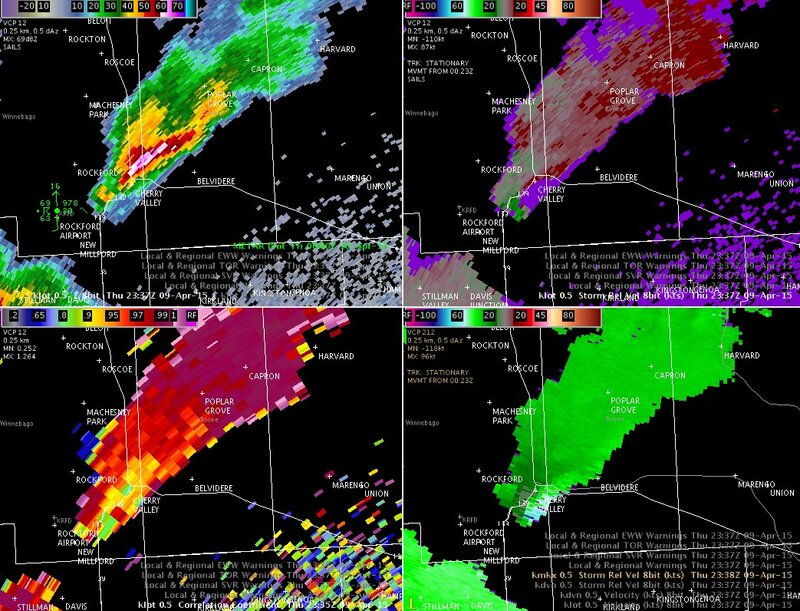 Part of a larger severe weather event that impacted the Central United States, the tornado first touched down in Lee County at 6:39 p.m. CDT (22:39 UTC). 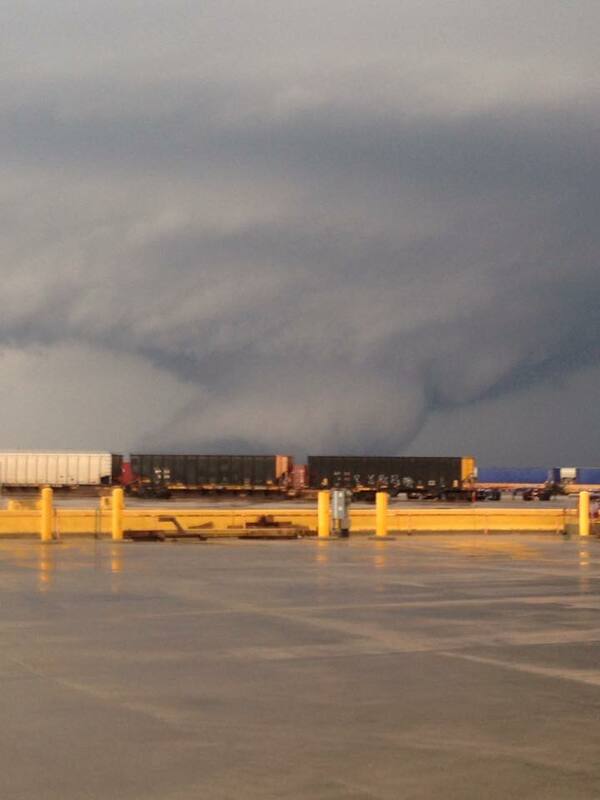 It progressed through the counties of Ogle, DeKalb, and Boone before finally dissipating at 7:20 p.m. CDT. 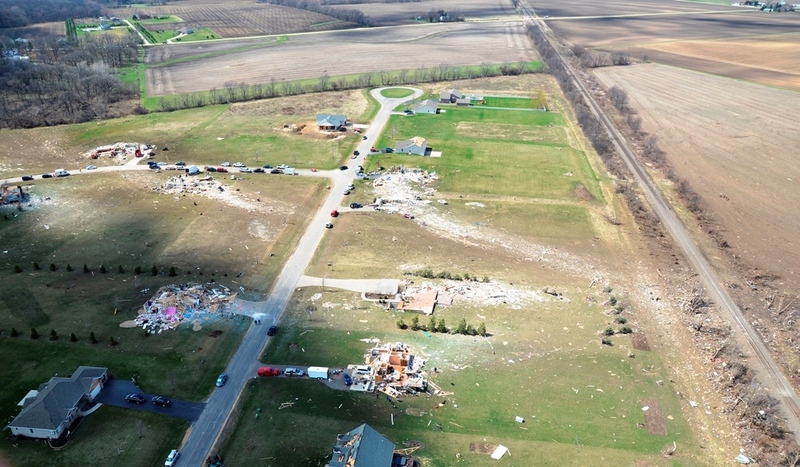 Along the tornado’s 30.14 mi (48.51 km) path, numerous structures were heavily damaged or destroyed, especially in the small town of Fairdale where two fatalities and eleven injuries were recorded. A few well-constructed homes were swept completely away, indicative of peak winds near 200 mph (320 km/h), the upper bounds of an EF4 tornado. In the aftermath of the event, hundreds of citizens assisted in cleanup and recovery efforts. Economic losses from the tornado reached $19 million (2015 USD). 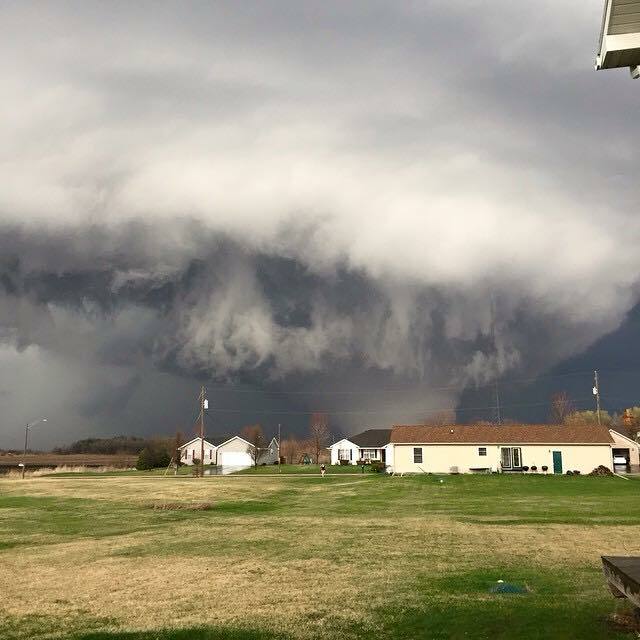 The strongest tornado in the United States during 2015 first began at 6:39 p.m. CDT (23:39 UTC) on April 9, just northeast of Franklin Grove, Illinois. It touched down over a field, producing swirls in crops, before moving northeast and causing EF1 damage to the Crest Foods plant. The tornado soon exited Lee County and entered Ogle County, inflicting EF1 damage to two farm outbuildings that were completely destroyed and EF0 damage to a similar structure that had a portion of its roof uplifted. Intensifying to EF3 strength, much more severe damage was noted along South Skare Court as the tornado entered an area of semi-rural subdivisions to the northwest of Rochelle. A few homes in this area were destroyed at EF3 intensity, with other homes nearby sustaining EF2 damage. One large house had a room ripped off on its second floor, while a split-level home was almost completely leveled. As the tornado crossed South Richard Road, it intensified to very high-end EF4 strength and inflicted catastrophic damage to several large homes as it impacted the Deer Creek subdivision. Well-built homes along South Richard Road and East Kuehl Court were leveled and swept from their foundations with debris strewn downwind. Several vehicles parked at these residences were moved some distance or tossed, and wind rowing of debris occurred. One house had its concrete walkway pulled a few inches from its original location, and notable scouring of lawn grass was observed in the subdivision. These structures were estimated to have been impacted by winds near 200 mph (320 km/h), the upper bound of an EF4 tornado. The homes swept away in this area were bolted to their foundations and there is some speculation that the tornado may have reached EF5 intensity at this point, though close inspection revealed that some of the washers were missing from the anchor bolts, and that low-lying shrubbery near the homes was left mostly intact, preventing a higher rating. 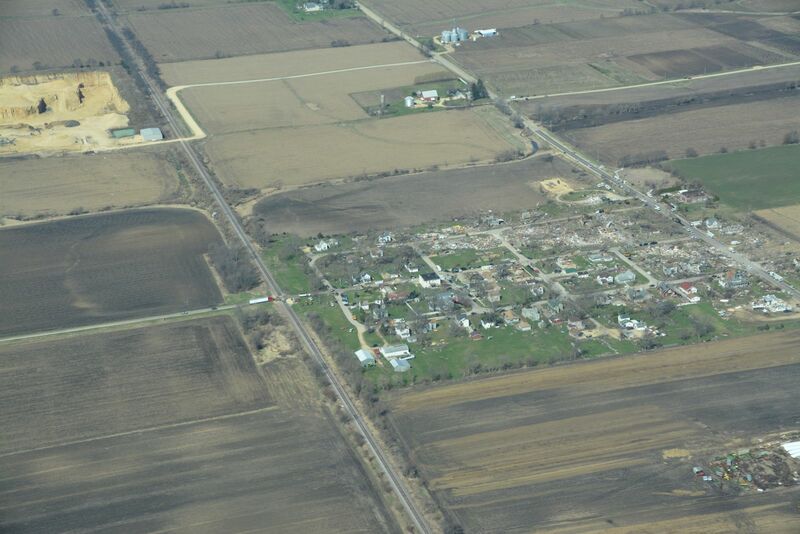 Continuing northeast, the tornado temporarily weakened, producing EF2 to EF3 damage as it destroyed a few large barns or outbuildings, ripped the roof off two brick residences, and collapsed most walls of another house, but once again gained strength as it approached and crossed Illinois Route 64. A large restaurant and a residence had their exterior walls collapsed in this area. A reinforced concrete silo that was completely destroyed by the tornado. 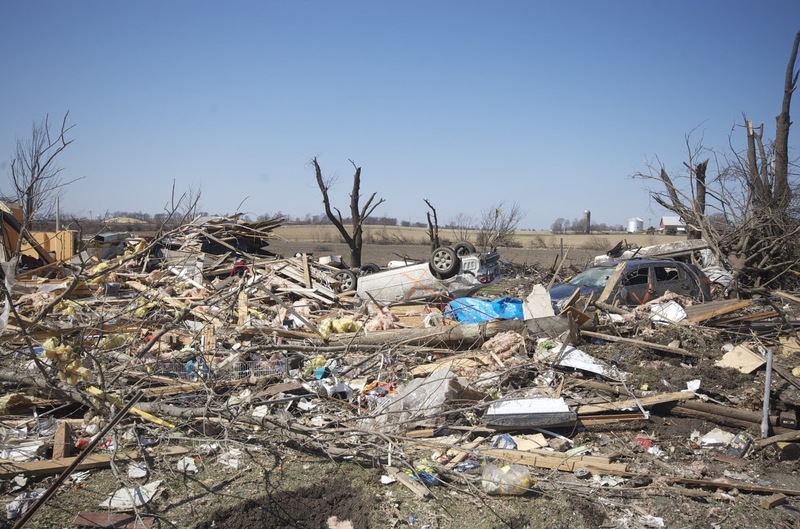 Very high-end EF4 damage was again observed near the intersection of Illinois Route 64 and Illinois Route 251, where a row of five homes was completely leveled, two of which were swept away. Anchor bolts were again present at these residences, though the foundations were of cinder-block construction. Intense ground scouring was evident nearby, a car was thrown a full mile, and debris was wind-rowed long distances through fields in this area. Winds were again estimated at around 200 mph (320 km/h), with the damage at this location again being near-EF5 in intensity. 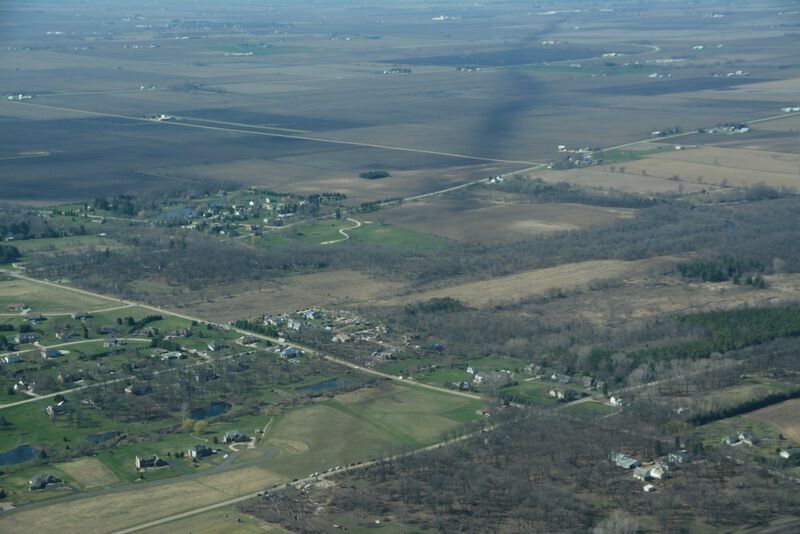 Further to the northeast, the tornado inflicted high-end EF4 damage as a large farmstead was completely destroyed. A well-constructed barn was completely obliterated, and a 40 ft (12 m) reinforced concrete silo was reduced to a pile of rubble. A large farmhouse on the property was completely swept away, and nearby trees were severely stripped and debarked. The tornado weakened as it crossed North Moore Road, where a warehouse building had a collapse of its non-bearing exterior walls. One small barn or outbuilding had a collapse of exterior walls while another had a few metal roof panels ripped off. After crossing Interstate 39, it caused moderate roof damage to a large residence and tossed and rolled a heavy barn. 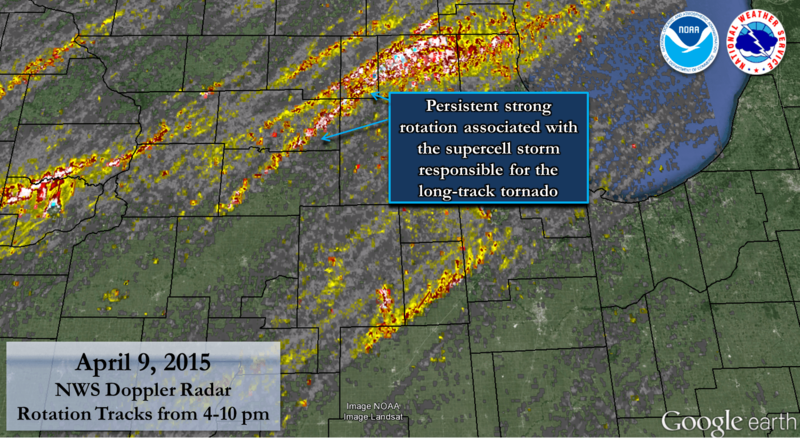 The tornado continued to produce generally EF1 damage to trees and outbuildings before exiting Ogle County, and it was briefly accompanied by an EF0 satellite tornado that damaged crops to its southeast. After entering DeKalb County, the large tornado directly impacted the small community of Fairdale. Approximately 71 homes sustained some degree of damage, including 13 that were destroyed. Several houses on the northwest side of town sustained damage consistent with an upper-end EF3 tornado, with all walls collapsed. A few houses that were nailed to the foundation—not bolted—were swept clean. A 67-year-old woman and her 69-year-old neighbor were both killed in their homes, and an additional 11 people were injured throughout the town. Continuing northeast across Wheeler Road, one residence had a large portion of its roof ripped off, a second residence had its exterior walls collapsed, and a two-story 80-year-old well-constructed barn was destroyed. A large garage was destroyed and had its debris deposited well downstream, and significant denuding and debarking of trees was evident. Near the intersection of Irene Road and McNeal Road, a well-built seven-year-old house lost its second story and many exterior walls. A two-story well-built barn with cinder block attachment was totally destroyed, and a nearby two-story rebar-reinforced cinder block silo was ripped apart. Large farm equipment was tossed 0.25–0.5 mi (0.40–0.80 km), and convergent scouring of road pavement was noted in this area. 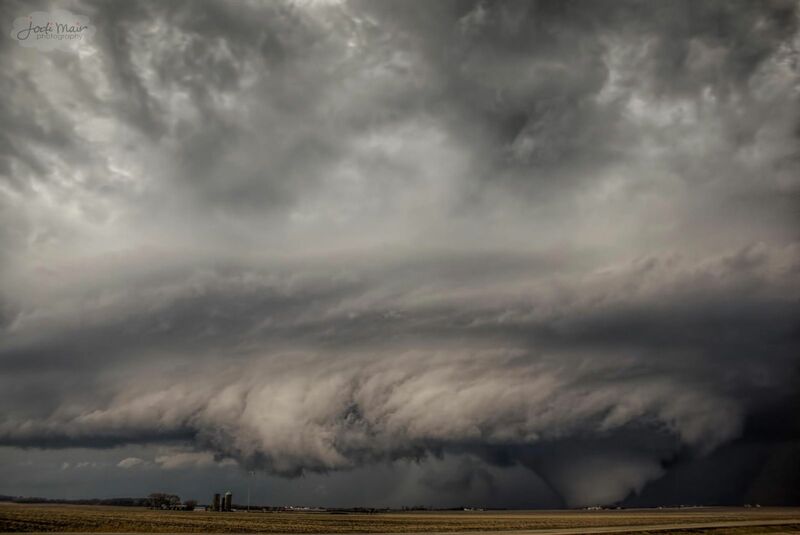 After passing over rural terrain, the tornado finally dissipated at 7:20 p.m. CDT (00:20 UTC) over Cherry Valley Road, ending its 30.14 mi (48.51 km) and 41-minute path of destruction. 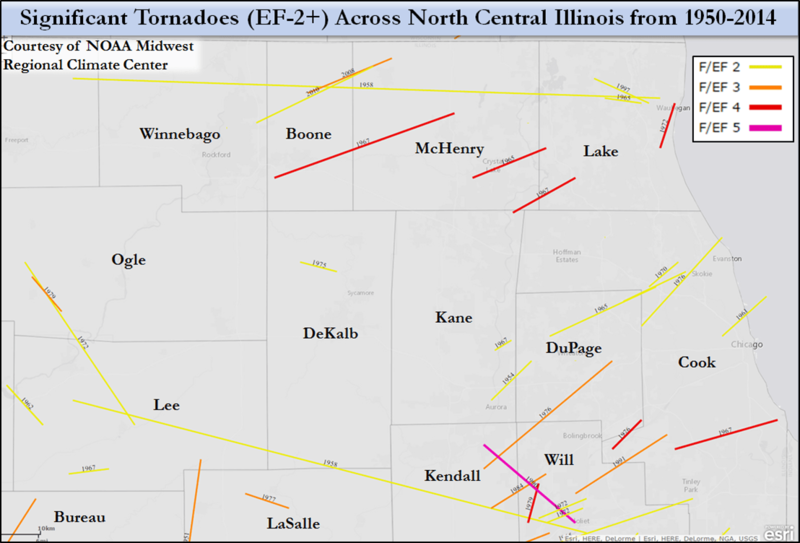 Eleven tornadoes were confirmed across Illinois: seven in north central Illinois in the NWS Chicago County Warning Area (CWA), two in northwest Illinois in the NWS Quad Cities CWA, and two in central Illinois in the NWS Lincoln CWA. 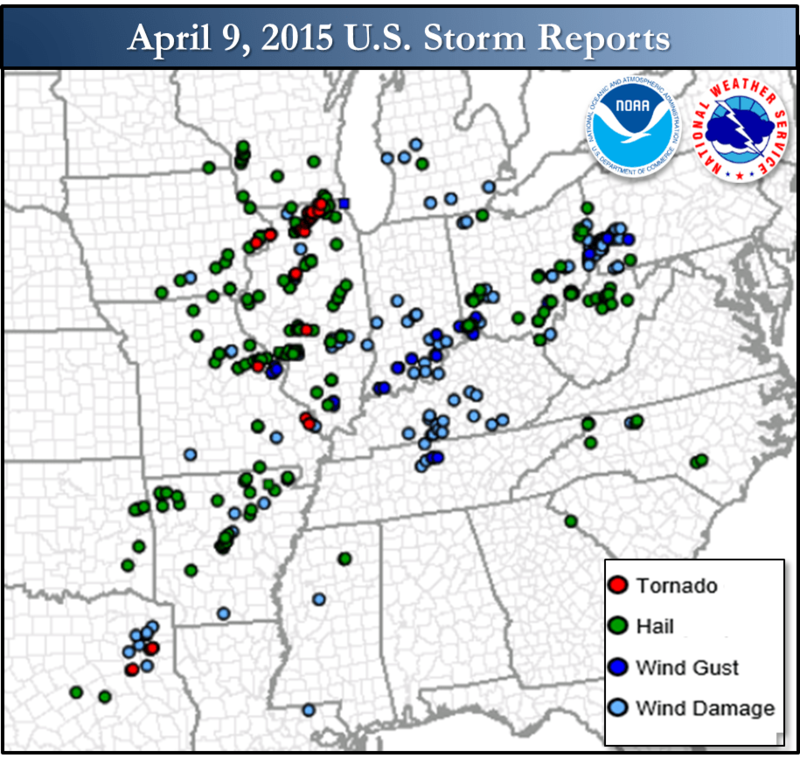 Six of the tornadoes across north central Illinois formed from one supercell thunderstorm. This includes the strongest tornado that was a long track EF-4 with maximum winds of 200 mph. 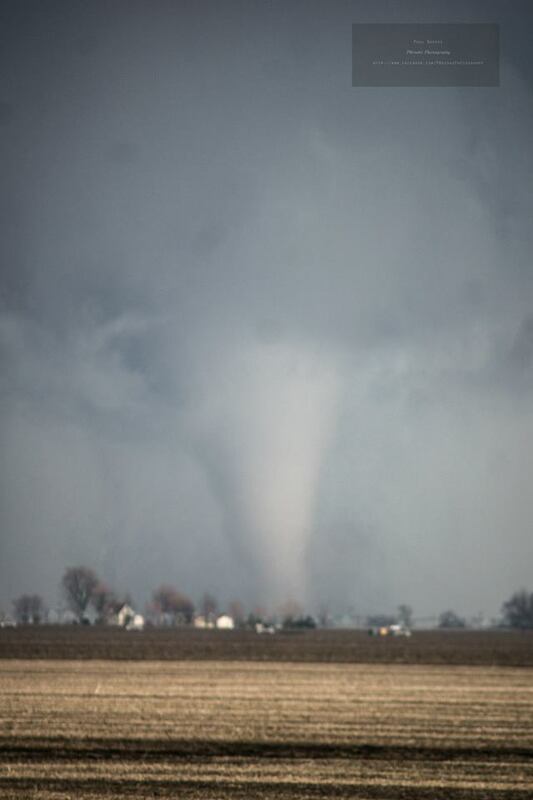 This tornado began from near Franklin Grove (Lee County), through the northwest side of Rochelle (Ogle County), across I-39, through Fairdale (DeKalb County), and ending south of Belvidere (far southern Boone County). 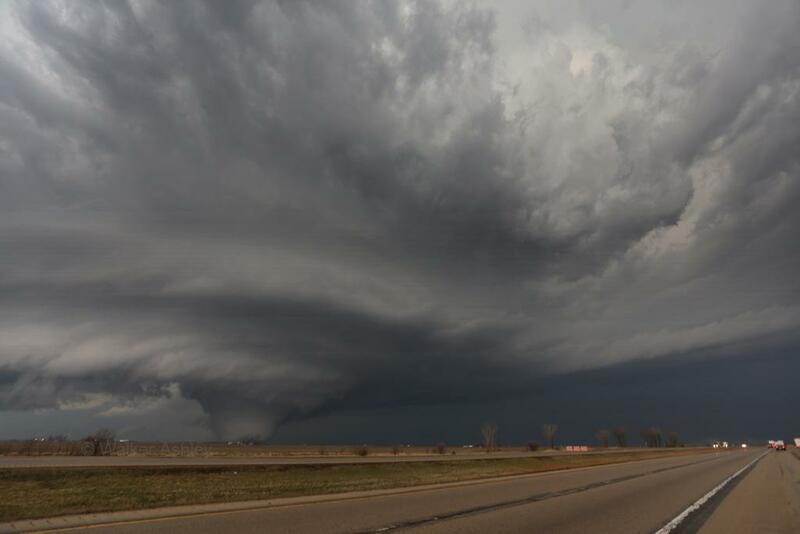 This tornado caused two fatalities, both in Fairdale, and a total of 22 injuries. A tornado of this magnitude is quite rare. This was the first EF-4 or stronger tornado in the NWS Chicago County Warning Area in 25 years, since an F5 tornado struck Plainfield on August 28, 1990. This was the strongest tornado on record (since 1950) for both Ogle and DeKalb Counties. 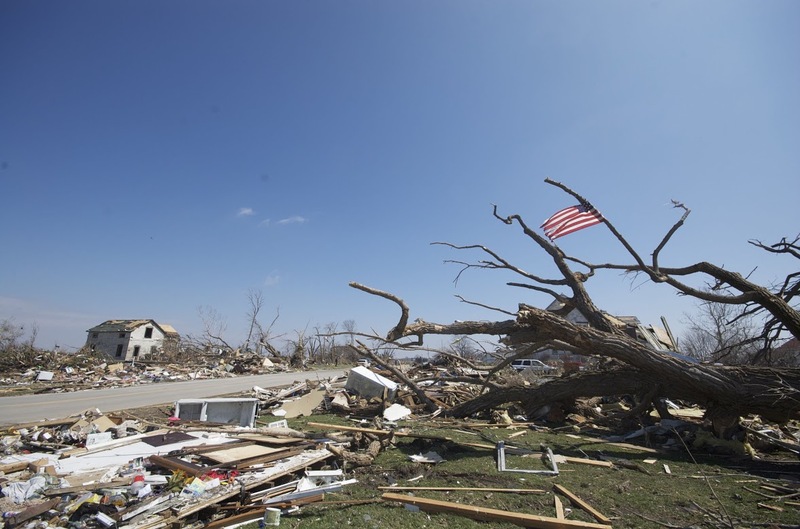 This was the first EF-4 tornado or stronger in Illinois since two EF-4 tornadoes occurred on November 17, 2013, including one that struck the community of Washington. 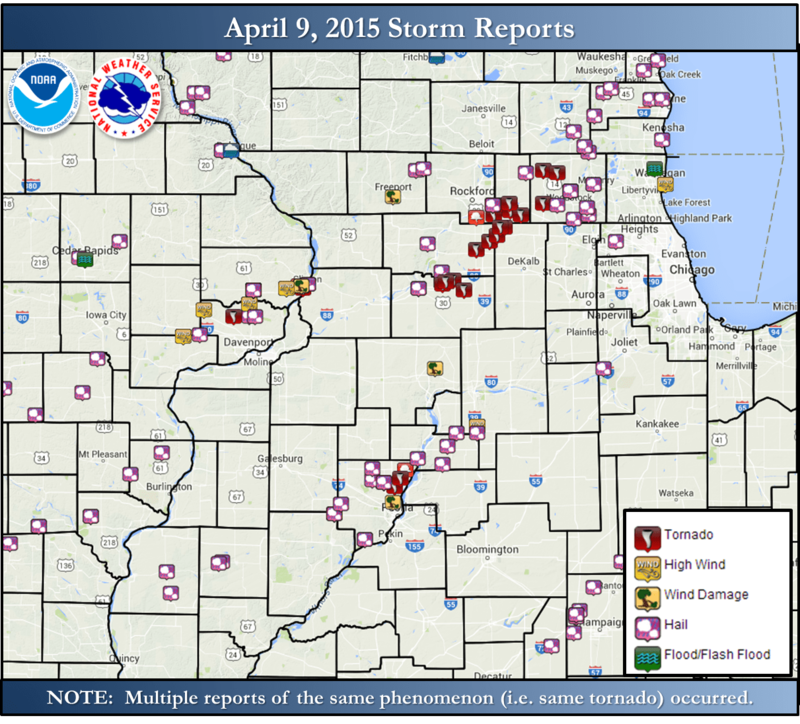 This was the 33rd EF-4 or stronger tornado in Illinois on record (since 1950). The atmosphere was ripe for severe weather due to highly anomalous moisture and instability for early April across the region. A strong low pressure system advanced into this favorable air mass. Combined with robust wind shear, this helped to trigger these potent storms. The potential for severe weather was mentioned in NWS forecast graphics and products as early as Saturday, April 4th. BELOW AS WELL AS THE DAMAGE INTENSITY. ENDING IN FAR SOUTHERN BOONE COUNTY. TORNADO DID NOT PRODUCE ANY DAMAGE. CONFIRMED USING AERIAL SURVEY INFORMATION AND RADAR DATA. NORTHWEST DEKALB COUNTY AND LIFTED IN FAR SOUTHERN BOONE COUNTY. TRACK EF-4 SHORTLY AFTER THAT TORNADO LIFTED. TREE DAMAGE ON THE NORTH SIDE OF THE ROAD BEFORE ENDING. TORNADOES INTO THE FOLLOWING CATEGORIES. 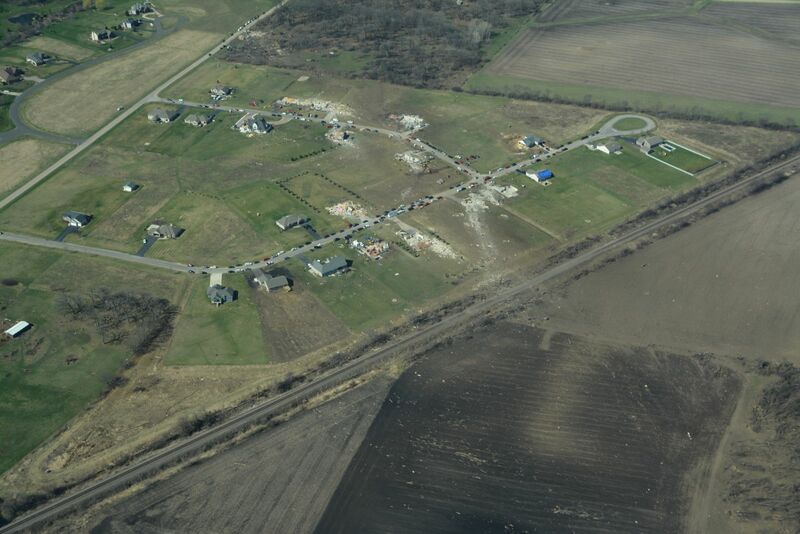 Another view of damage to a neighborhood northwest of Rochelle showing high-end EF-4 impacts to homes. East of Dixon. This is the base of the storm that would soon thereafter produce the long-lived tornado that would track into Ogle and DeKalb Counties. Courtesy of Lora Ludwig. Near Ashton. Courtesy of PBrooks Photography. 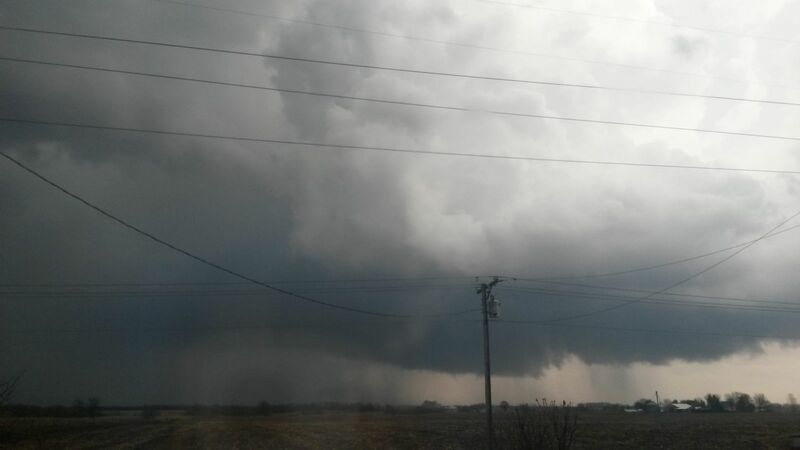 Looking northwest of Rochelle. Courtesy of Dean Schultz. 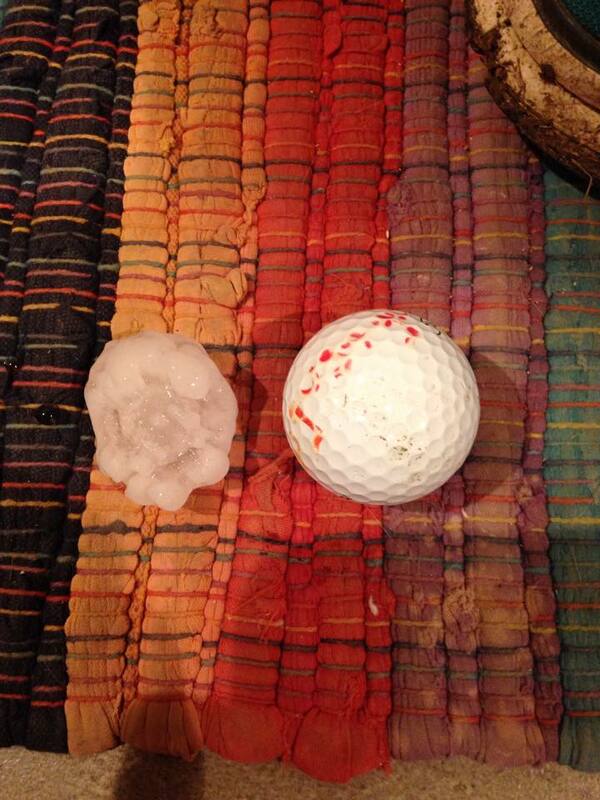 Large hail at McHenry Country Club. Courtesy of Jeff Grubich. Near I-39 Looking North of Rochelle. Courtesy of Jodi Mair. Near I-39. Courtesy of Walker Ashley. Near Hillcrest. Courtesy of Larissa Sebree. 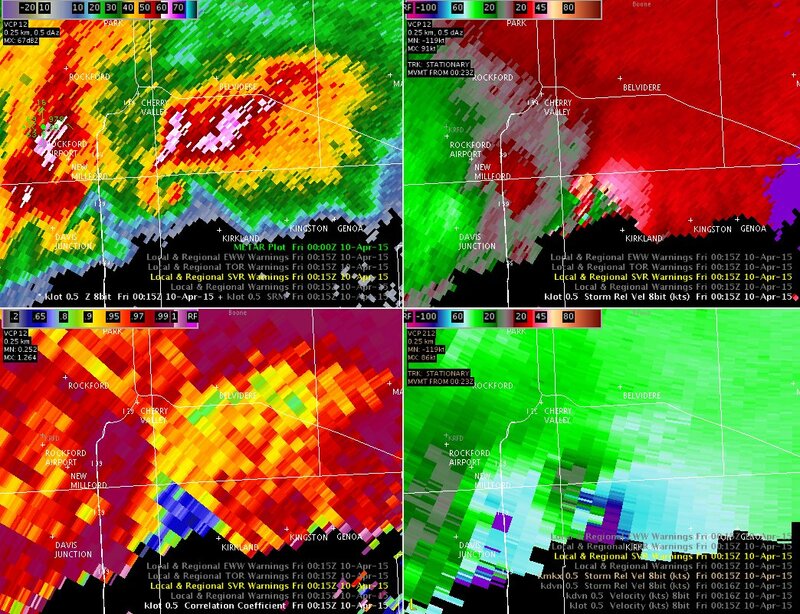 The four panel radar images below display: radar reflectivity (top left), radar storm relative velocities from two different radars (top right and bottom right) and Correlation Coefficient (CC). Storm relative velocity tells us if a storm has rotation. The green colors in the imagery represent winds blowing towards the radar, while the red colors indicate winds blowing away from the radar. 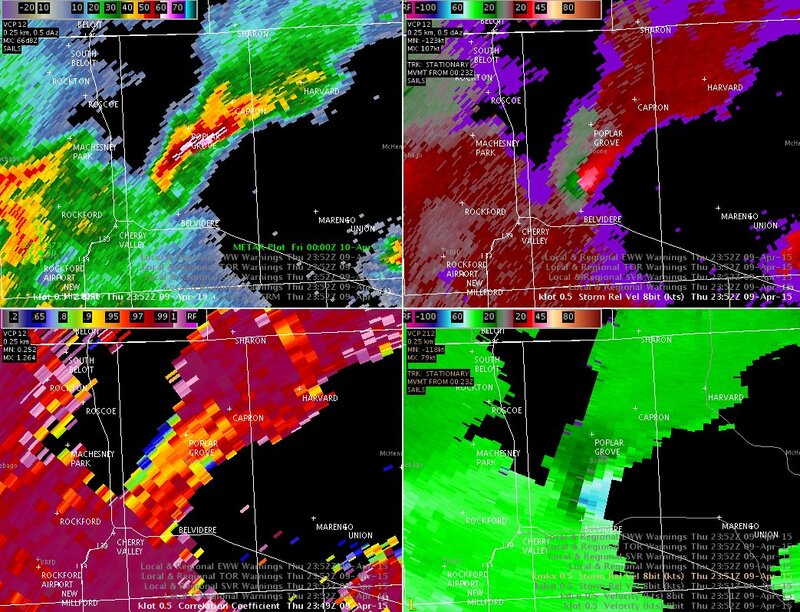 Therefore, strong rotation can be inferred in the storms showing bright red colors directly adjacent to bright green colors in the storm relative velocity images. This is also the area of the storm where the tornado is most likely to be occurring. 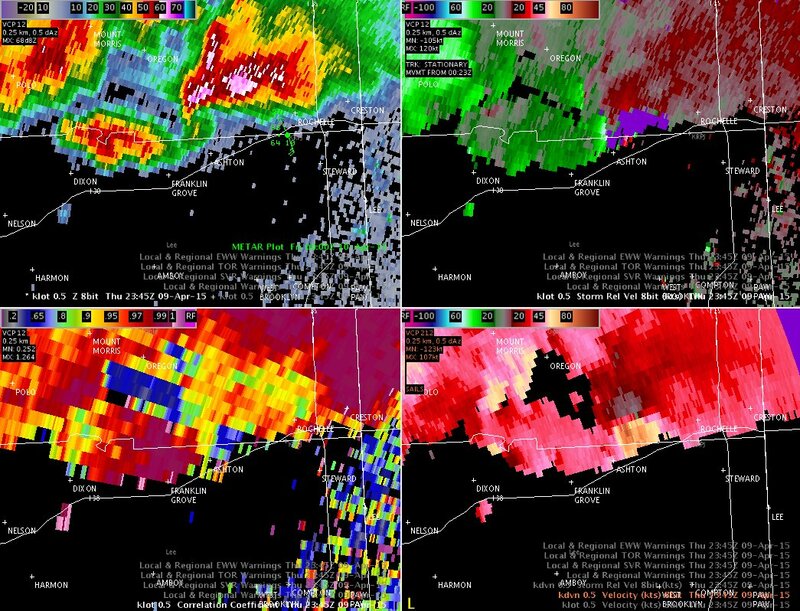 Reflectivity and storm relative velocity used together with CC data can indicate the presence of debris resulting from a tornado. In basic terms CC is the correlation between the reflected horizontal and vertical power returns that the dual pol weather radar provides. CC data tends to be near one with most precipitation type echoes. Therefore, when the CC data is found to be very low (represented by the blue colors), it suggests that the radar is not sampling precipitation. Notice that in the second radar four panel for the Franklin Grove to Margeno supercell time stamped 6:59 pm that a clear area of low CC data (Blue area) is identifiable within the radar reflective hook echo just north of Rochelle. This area also corresponds with the area of strong rotation as noticed in the storm relative velocity image in the top right. 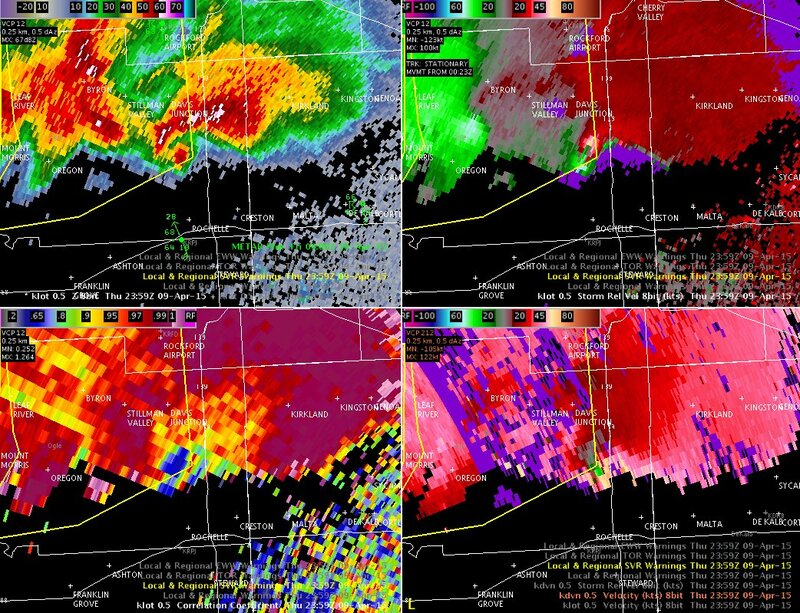 The Low CC in this area tells the radar operator that the strong reflectiveives within the hook echo in the top left panel is not precipitation, but is actually the radar seeing the debris being lofted from a tornado. The peak tornado season in Illinois is April through June. This was the first EF-4 or stronger tornado in the NWS Chicago County Warning Area in 25 years, since an F5 tornado struck Plainfield on August 28, 1990. This was the strongest tornado on record (since 1950) for Ogle County, where EF-4 damage was observed. 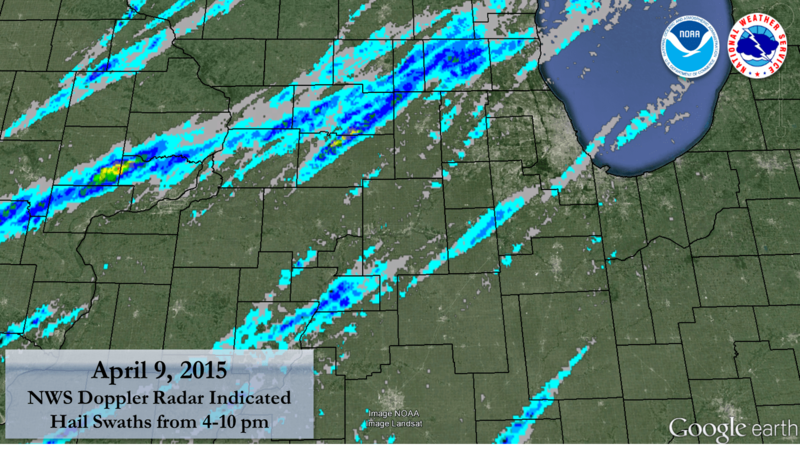 The previous strongest tornado on record in Ogle County since 1950 was an F-3 on August 5, 1979. 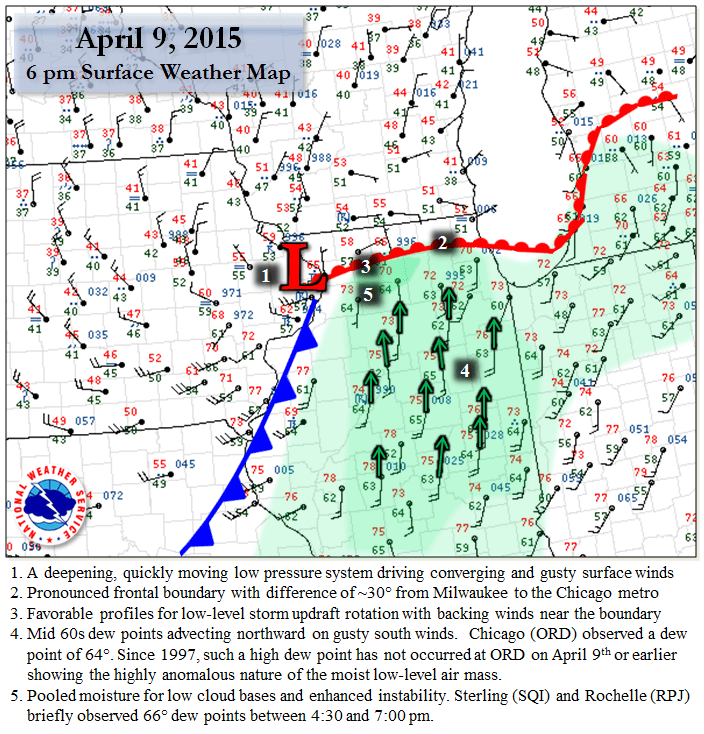 The last tornado in Ogle County prior to April 9, 2015 was May 22, 2011, when three EF-1 tornadoes occurred. This was the strongest tornado on record (since 1950) for DeKalb County, where EF-3 damage was observed. The previous strongest tornado on record in DeKalb County since 1950 was an F-2 on June 18, 1975. 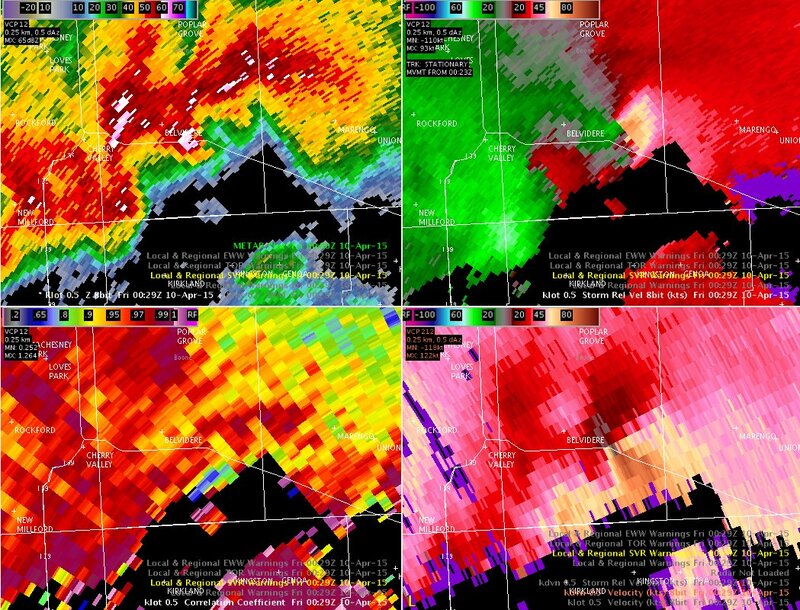 The last tornado in DeKalb County prior to April 9, 2015 was an EF-0 on May 13, 2011. UPDATE: Matthew Harkey has been booked into the Winnebago County Jail. His next court date is 04/30/2019 at 9:00 am. Update from our friends at WTVO – According to court records, a 34-year-old Rockford woman was found naked, bleeding and handcuffed to a workout bench she was dragging behind her after she was abducted from her Rockford home. Police say 43-year-old Matthew Harkey abducted the woman from her home on Wednesday, March 13th, and held her captive in the basement of home in Roscoe, where he beat and raped her. A neighbor in the 5900 block of McDonald Road spotted her in the street after she made her escape, around 1:30 p.m., and called the police. According to an order of protection filing, the woman told police that she was attacked by Harkey earlier that morning, as he was hiding in her home when she returned home from dropping her children off at school. According to the victim, Matthew Harkey hit her over the head with a bottle. She fought with him until he choked her and she passed out. There, he dragged her down to the basement and handcuffed her to an exercise bench and strapped her legs to it. “He undid the straps and took my underwear, shirt and bra off. My pants had already come off,” she wrote in the order of protection filing. He crashed during a police chase, and is now in police custody via police. Harkey led police through Edgar, Douglas and Coles counties. He crashed near Illinois 32 about halfway between Cerro Gordo and Cisco in western Piatt County. According to a state police report, at 2:15 a.m. Thursday, Matthew Harkey, 43, was heading north on Illinois 32 while being pursued by multiple authorities when he lost control about a quarter-mile north of County Road 1045 North, hitting the guardrail and causing his Nissan Rogue to overturn multiple times. The report said Harkey, who was not wearing a seat belt, was ejected from the vehicle and taken to an area hospital with non-life-threatening injuries. The suspect Matthew Harkey abducted a woman at an address on Lamar and she was able to get away and was located in the 5900 block of McDonald Road. She did sustain injuries. Police are searching all over for him. They chased him several times and was last seen near Shaw and Newburg. He was last seen in a 2019 Nissan Rouge with a plate of FP65916 or a red Mitsubishi Lancer Illinois registration BA36134. Sources said he worked at the Napleton Loves Park Honda near Carlson Ice Arena, we are still awaiting confirmation on this. If you see him, call the police. Update** last seen driving a Silver Nissan Rogue FP65916. On Wednesday, March 13, 2019 at approximately 1:34pm Roscoe Police officers responded to the 5900 block of McDonald Road for a possible abduction. They located a female victim suffering from injuries to the head. It was determined that a male suspect Matthew Harkey, (dob 11/11/1975) had abducted the female from her residence in Winnebago County. The female was able to escape and notify authorities. The case was reviewed by the Winnebago County State’s Attorney’s Office and a warrant was issued for the charges of Home Invasion, Aggravated Criminal Sexual Assault, Unlawful Restraint, and Residential Burglary. The bond on the warrant has been set at 1 million dollars. Matthew Harkey is possibly armed and should be approached with extreme caution. Matthew Harkey could be driving a silver Nissan Rogue Registration Illinois FP65916 or a Red Mitsubushi Lancer Illinois Registration BA36134. The charges are merely allegations and the defendant is presumed innocent until and unless proven guilty in a court of law. Sources are reporting a man wanted for home invasion and sexual assault. Suspect is approx. 43 years old, 5’9, 200 lbs, brown hair, brown eyes, last seen in a silver nissan rouge. Armed with a gun. First name is Matthew. He is wanted for home invasion and sexual assault. Possibly suicidal. UPDATE: Last seen near Perryville and Spring Brook. UPDATE: Last seen near Shaw and Newburg approx 6 pm. Police are chasing the vehicle, but lost sight of it in this area.